Once you enter Sudan you must register at the Ministry of Interior within three days after arriving in Sudan. 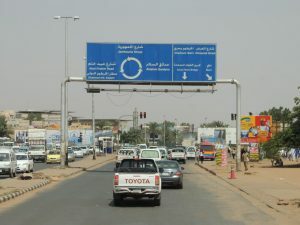 All foreigners traveling more than 25 kilometres outside of Khartoum must obtain a travel permit from the Ministry of tourism in Khartoum. You also must obtain a photography permit from the Sudanese Ministry of Interior, Department of Aliens before taking any photos. 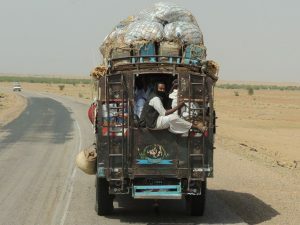 These regulations are strictly enforced, and even travellers with proper documentation may expect delays or temporary detention by security forces, especially outside the capital. Authorities expect travellers to strictly respect roadblocks and other checkpoints. Ensure you have no visas issued by the Government of Israel or other evidence of travel to Israel, such as exit or entry stamps as you will not allowed entry into Sudan. 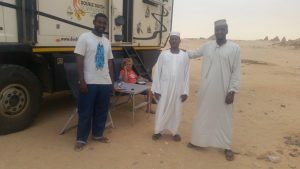 Despite many concerns re the safety around Metema we had no issues and our first night in Sudan was spend camping in the bush 70 km from the Sudanese/Ethiopian border. Sudan is a country located in north-eastern Africa. Prior to the separation of the south in 2011, (Now called South Sudan & Sudan) Sudan was the largest African country, with an area that represented more than 8 percent of the African continent. 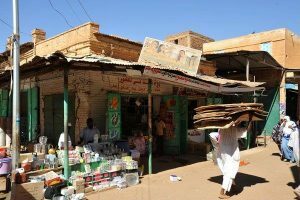 Sudan’s capital, Khartoum, is located roughly in the Centre of the country, at the junction of the Blue Nile and White Nile rivers. Sudan is a hot country. Sudan’s central and eastern areas have the highest mean annual temperatures, typically ranging from the mid-30s to mid-40s C). Khartoum must be one of the hottest capital cities in the world, average temperatures well over 35 degrees and little cooling off at night. Khartoum is a low-built, sprawling city. It sits on either side of the River Nile under an almost perpetual haze of dust. The Nile River system is the dominant physical feature, and all streams and rivers of Sudan drain either into or toward the Nile. It enters the country as the White Nile in the South West. Power cuts are frequent, and the heat is oppressive. 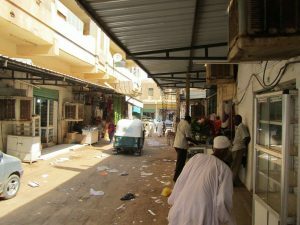 Khartoum has no real central business district. 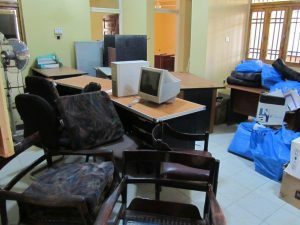 And like many other poor countries around the world offices are setup in high rise or rented houses and 40-year-old desks are set up in converted bedrooms. There are few public spaces for people to mingle, but the poor and the rich do mix in open-air street markets to buy their groceries. Khartoum, over the years, had the longest civil war in African history between the north and south of the country, and the death and displacement of millions in Darfur and the Nuba mountains. From 1955 until 1972 Sudan had a costly and divisive civil war and in 1983 the civil war resumed, this time due to lack of economic development in Sudan. Worldwide attempts to end the civil war, including cease-fires and agreements yielded very little success until 2005. On July 9, 2011 South Sudan was declared an independent country. 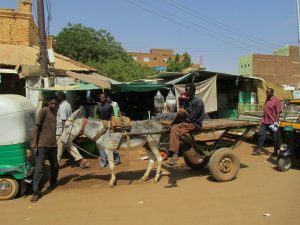 Interesting suburb of Khartoum is Omdurman, where in 2010 we visited the souk and the Camel market. Most of the animals are brought in on foot from Darfur and South Sudan since these areas are greener and more fertile. 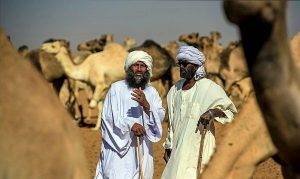 However, the desert nomads also bring in their fair share of animals to sell. Once the camels have been sold they have one of their front legs tied back. This prevents them from running off. The fast camels are for racing or simply for travel if you happen to travel light. 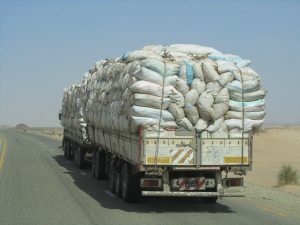 The camels bred for toughness are intended for carrying lots of cargo. A decent camel that is either strong or fast will cost about $500. If you want a premium camel that is both fast and very strong, you can pay up to $1200. In fact, all sorts of animals can be purchased here including goats, donkeys and cows. A decent donkey will sell for around $ 13.00. A quality goat will set you back around $ 12.00. The Sudanese Pound is worth just 6.4 pounds to the dollar at the bank, but the black market gives you an unbelievable 16pounds for the dollar. The official banking system struggles to supply dollars needed to buy imports. There is a lot of demand for the dollar at any price due to its scarcity,” locals tell us. 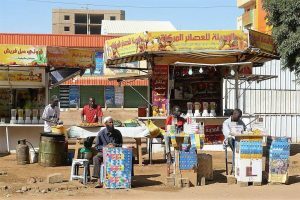 Prices soared in Sudan after South Sudan seceded in 2011, taking with it 75% of the country’s oil output. 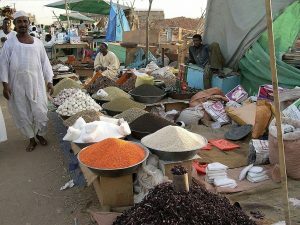 tTe main source of foreign currency used to support the Sudanese pound and to pay for food and other imports. 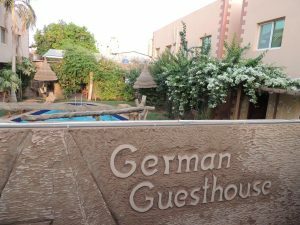 After 5 days Khartoum at the German Guesthouse organizing permits and stocking up on food and lots of swimming to cool down it was time to leave and explore the Northern Part of Sudan. 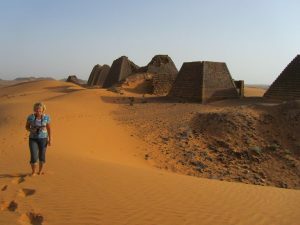 5 days Khartoum was enough, our first stop north was at the Meroe pyramids. Along the banks of the Nile River lies a collection of nearly 200 ancient pyramids. The Meroe pyramids, smaller than their Egyptian cousins, are considered Nubian pyramids, with narrow bases and steep angles on the sides, built between 2,700 and 2,300 years ago. 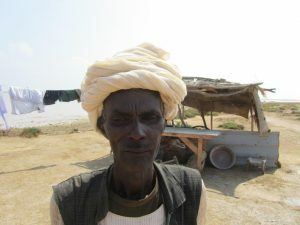 This is the main tourist attraction in Sudan, but we were the only guests again as we were in 2010. 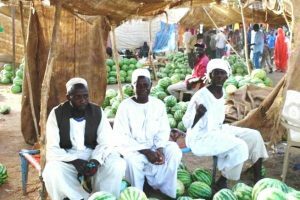 The local industry has been devastated by a series of economic sanctions imposed by various Western nations throughout the course of the country’s civil war and the conflict in Darfur. 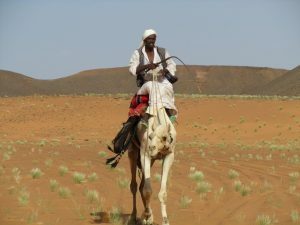 According to what we hear, Sudan now receives fewer than 15,000 tourists per year, compared to past estimates of as many as 150,000. Having said this the unfriendly people at the embassy when applying for a visa are not helping either. 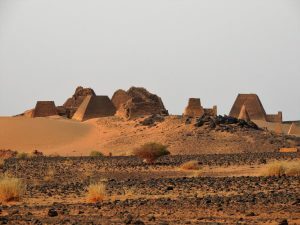 The most visible remains at Meroe are its pyramids, which contained the tombs of more than forty kings, queens, and other important individuals. 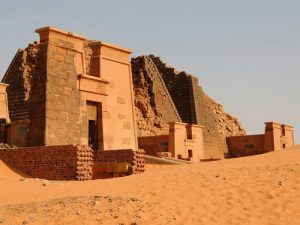 Today Meroe is the largest archaeological site in the Sudan. 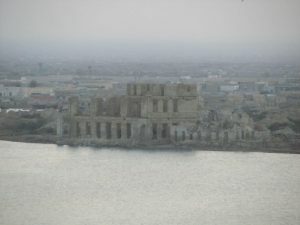 Situated about a half a mile from the Nile, the city ruins extend over a square mile in area. 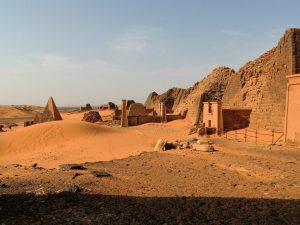 Meroe was included in the UNESCO list of World Heritage sites in 2003. 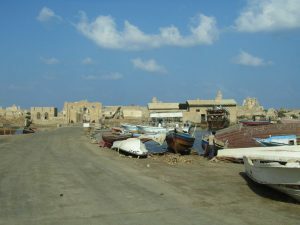 Near the site are a group of villages called Bagrawiyah. 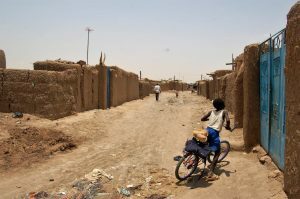 This city was the capital of the Kingdom of Kush for several centuries. It did not take long for the locals to find our bush camp. It was hot and time to move on to Karima and Jebel Markal. Our first stop was Atbara a city of 120.000 people. 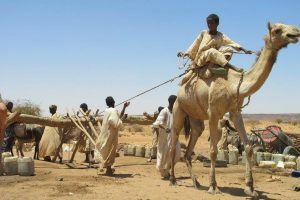 Most employment in Atbara is related to the rail lines. 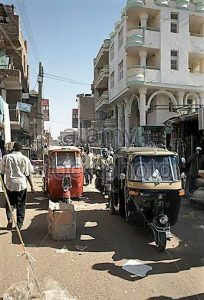 It is known as the “Railway City,’ and The Sudanese National Railway Company’s headquarters are in Atbara. We filled up with diesel at 20 cents a litre. Next stop Karima a dusty Nile-side Nubian village. 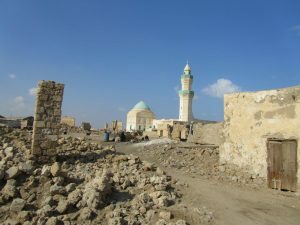 If it weren’t for the large collection of ancient sites, which has given the whole area UNESCO World Heritage status, there would be little reason to stop here. This time I found a better track than in 2010 when we got bogged in this area and spent a few hours digging. Karima with an average temp of 37 degrees throughout the year (48 degrees for July-Aug and Sept) is not what you would call a cold place. 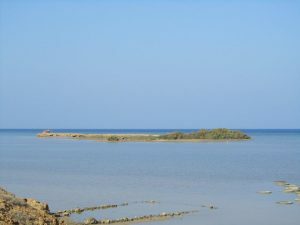 The land around Karima is the centre for Barakawi dates. Sudan is among the countries that produce good quality dates. The areas around the Nile boast extensive date groves all the way to the Egypt border. The most striking feature of the landscape coming out of the desert is the sudden green narrow band of palm trees lining the shores of the Nile. 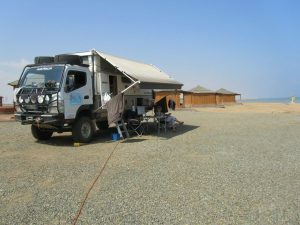 Our bush camp was planned at Jebel Barkal. Jebel Barkal a very small mountain located in Karima on a large bend of the Nile River. The mountain is 98 m tall, has a flat top, and apparently was used as a landmark by the traders in the important route between central Africa, Arabia, and Egypt, as the point where it was easier to cross the great river. 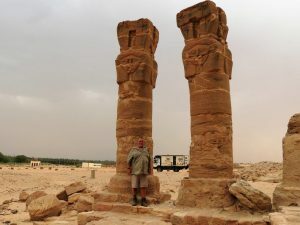 The ruins around Gebel Barkal include at least 13 temples and 3 palaces. 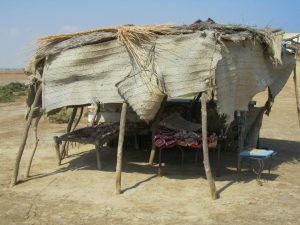 After we spend at least 4 hours in the area and had set up camp the locals told us to move on unless we paid 25USD. 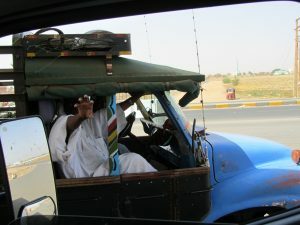 (First and only time people in Sudan where unfriendly towards us). We decided to move 10KM out of town and bush camped in the desert. We passed Dongola, a little town full of character and famous for its palm groves. 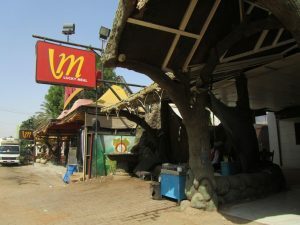 Our next stop was in the Nubian town of Abri, where we stayed outside the Nubian guesthouse hosted by Maghzoud. 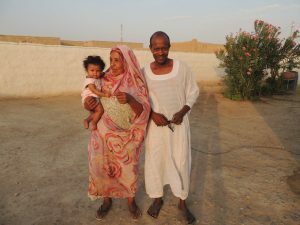 Maghzoud took us to his house for tea and to meet his wife and newly born baby and offered us a glimpse of truly Nubian hospitality. Abri is a small town on the river bank of the Nile, and it lies near the second cataract that is now submerged by Lake Nasser. Its population is estimated to be about 40,000 residents. 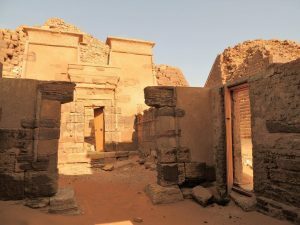 Our last town visited in Sudan was Wadi Halfa on the shores of Lake Nasser in the north of Sudan, and marks the point of departure for us to Egypt. 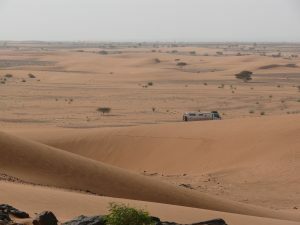 It is surrounded by the dunes of the Nubian Desert and the eastern edge of the Sahara Desert. 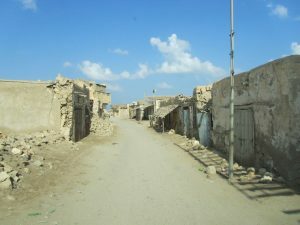 The town is the new Wadi Halfa; the original Wadi Halfa was submerged when the Aswan High Dam created Lake Nasser in 1971. 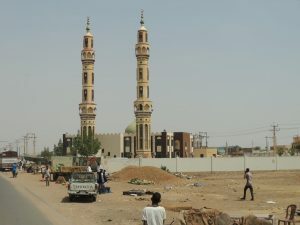 Sudan’s military dictatorship forcibly removed the approximately 50,000 inhabitants of the area from their lands and relocated to the desert, where many died of malaria and other diseases. It now is the terminus of the rail line from Khartoum and the point where goods are transferred from rail to ferries going down the lake or on trucks to the new border. The new border is 25km north of Wadi Halfa. Our last night in Sudan we bush camped in the desert 5KM south of the Egypt border. Famine, war, drought and suffering that is what comes to mind when people hear the word Sudan. It has been prominent in the news over the past few years. The war in Darfur is a devastating genocide that has caused thousands of deaths and casualties in the country. To most of us the North African nation of Sudan is often seen as a place of untold horror. A burning and featureless desert where war, genocide and misery are the norm. And yes Sudan is a nation in turmoil. 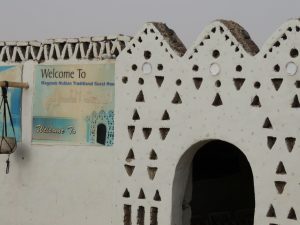 The current travel advisory has been in effect since October 2006, and warns of terrorist threats aimed at Western interests in Sudan which include tourist sites and locations where westerners are known to congregate. Sanctions and the lack of foreign currency are hurting the average person in the street but not those in power. 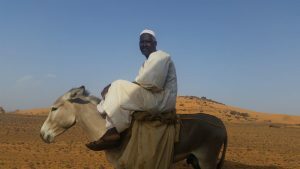 During our visit we enjoyed Sudan, never felt unsafe and never saw any signs of trouble. However war is destroying South Sudan and Western Sudan and we wondered what those army planes had on board taking off from the airports and returning hours later? 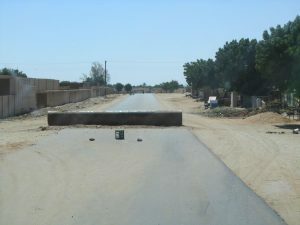 The amount of road blocks and army checks is time consuming and travelling west of Dongola we saw lots of army and signs of war in the area. He has partially accomplished his objectives by instituting a policy of divide and rule among Sudan’s diverse population allowing him to use the people of Sudan to kill and displace each other. Massive corruption has destroyed Sudan while enriching the foreign bank accounts of a select few. International response to Bashir policies has failed to stop attacks, deaths, injuries and displacement of millions of people. Peacekeeping missions have failed for most parts to protect the people. 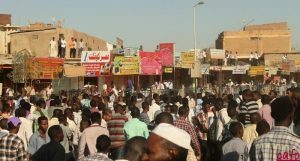 International mediation efforts and many statements of concern condemnation and demands have all been ignored by the government of Sudan. Crimes committed in Darfur, Nuba Mountains and Blue Nile region resulting in arrest warrants for Omar Bashir and a few of his henchman are not enforced nor are the sanctions. that operate in Africa and the Middle East. The regime also supports the Muslim Brotherhood and it provides arms to the Islamic rebels in Libya. 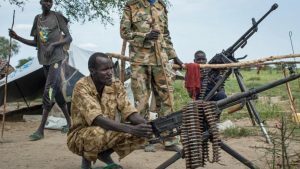 Only this year troops and militia from the rapid support force, killed and raped civilians in the Nua mountains and bombed farm land in the Blue Nile region. International Dialogue looks great on paper, but it is going nowhere. The regime is not serious, instead buying time and maintaining status quo, to keep the world happy. What a difference in 200 meters, friendly and helpful people. I found another black-market dealer and changed some US money for Sudanese pounds for an even better rate. As we had been descending the mountain from Ethiopia towards the Sudan border the temperature climbed and as we were travelling into Sudan at around 2pm it was around 42 degrees Celsius – a taste of what is to come. After 3 hours and all border formalities finished we were ready to go. 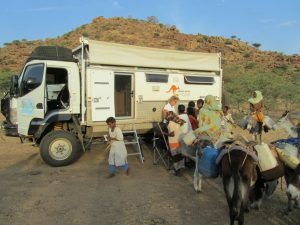 Around 5pm we pulled off the road for about 1km and set up camp between a small village and the water well. The local population all came past to say hello and that included shepherds with their cattle, goats and camels. 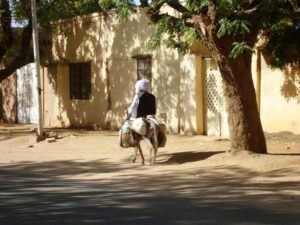 The Muslims on their way back from prayer, people on donkeys, ox carts, etc. All part of our entertainment and there was no “You, you, you, give me, give me, give me.” It was an amazing contrast to what we had just experienced in Ethiopia. Our campsite reminded us much of a bush camp in Australia except we were surrounded by camels, goats, donkeys, shepherds, the Imam, and local Muslims. No alcohol. 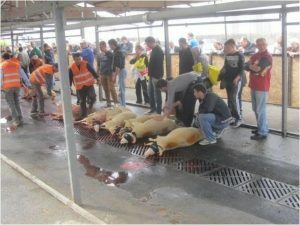 We had a nice BBQ and I have to say it was difficult with all those poor people looking at us and no doubt the smell went a long way. However, no-one asked for anything and everyone was all smiles. By this time, I am sure the whole village knew we were on their land. At 9pm it was still over 35 degrees outside and inside the truck it was still over 40 degrees. No need for a campfire. We went to bed with a great lightning show in the distance and 5 million stars looking down at us. What a contrast to Ethiopia. We can bush camp again without 200 kids screaming for money and tour guides trying to rip us off for the next tour. I can even go to the toilet without anybody following me. We also enjoyed the trucks coming past in the distance with complete light shows on the trucks in every colour imaginable. A perfect night in peace. The night would have been one of the warmest we have had since we arrived in Africa. The previous night we were still at 2600 meters and the temp went under 10 degrees. Now we are at 350 meters in a semi desert area and the wind is hot and dry. It feels warmer than what it is because we have been travelling up to 3200 meters and hardly ever went below 2500meters for the past 4 weeks. 1.Aliens Registration within 3 days of arriving in Sudan. 2.Travel Permit to travel South, North and West Sudan. 3.Photo permit to take photos (That is restrictive photos as the list of things we can`t photograph is as long as my arm). 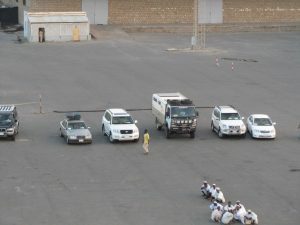 Organize the ferry for Saudi, but this cannot be done before we have the Saudi Visa. We may have to extend our Sudan Visa as they only issued a 2 week Visa. Get ourselves registered in Sudan. We did this on the border in Southern Sudan, but this must be done again in Khartoum. 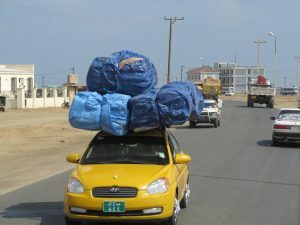 Within 3 days of arriving in the City and before travelling to Western Sudan. This had to wait as our Visa had to be delivered by the fixer today. Otherwise it would not be ready before Wednesday afternoon. Funny that this department is responsible for all foreigners in Sudan, but no-one speaks English and there are no signs in English. They call it a heat wave for this time of the year and believe me, we are really feeling the heat after all the cool nights and days we have had in the last few months. Most of our time has been spent at an altitude of around 2200 meters (between 1700 and 3300 meters). Now we are at around 300 meters. Today it is Sunday, but all the shops are open and so is the Embassy of Jordan. We delivered our passports at 9am and were told our visa would be ready for pick up at 3pm. So, it is a good day to explore Khartoum. Khartoum is located on the junction of the Blue and White Nile Rivers. 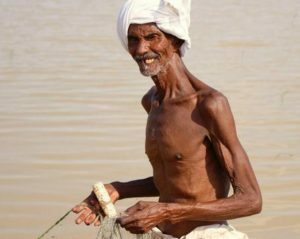 The population of Khartoum is less than 1 million people and it still struggles with its water supplies. Khartoum is famous for its fierce sandstorms, which we hope we will avoid. The majority (85%) of the Sudanese people live off the land growing cotton, peanuts, Arabic gum, sugar and the like. However, a ruthless climate and low global prices and an infrastructure that is nearly non-existent, have made life very hard for Mr Average and we hear there is a lot of trouble between people and government. Last night we were also advised of a curfew that exists in Sudan from 10pm till 4am. We arrived back at the Jordan Embassy at 2pm and yes, our Visa was ready. We then quickly made our way to the Saudi Embassy in the hope of getting there before they close at 3pm. With a bit of luck, they will still be able to accept our passports. But no luck! No one speaks English and we do not speak Arabic. I was asked to come back at 9am in the morning. First call this morning was the Saudi Embassy. This is how it went. “Anyone speak English? We are unable to read the passport application.” We quickly realized that we had no choice other than to pay a fixer to assist us. 100USD per person and we could get a 3-day Transit Visa for Saudi Arabia. Anyway, before we handed in the passports we required 3 more permits. 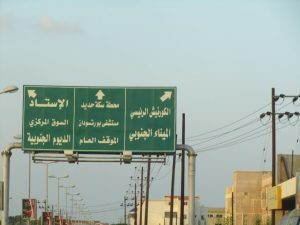 With all signs being in Arabic and a taxi driver who speaks no English, it took over 2 hours before we had the 2 permits. A busy day but we got a lot done and it is stinking hot. Tonight, we had a visitor, the Jordan Ambassador had heard of our trip and wanted to see our truck. At the same time, we received a lot of Info about Jordan, so it worked both ways. In fact, we were asked why we did not speak Arabic when we want to visit Saudi Arabia? 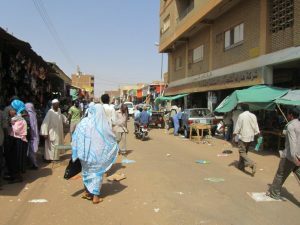 While in Khartoum we travelled to Omdurman across the river from Khartoum to visit the local souq (the largest in Sudan). En route we passed the office of the President and many other official offices, including the UN compound. 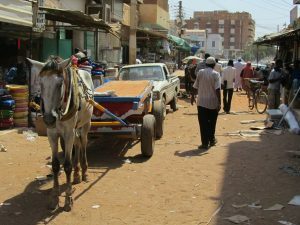 Omdurman is the centre of Industry and Finance and is the largest town in the country. As we were not registered we were not allowed to leave the city of Khartoum/Omdurman. We had planned to go out for dinner tonight to celebrate our anniversary. But with 45 degrees we find we are not that hungry. 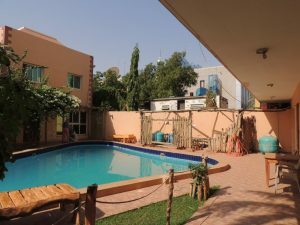 We were told that the UN has a pool and a restaurant area in Khartoum where for 20 AUD we could have a swim. No, that didn`t include a meal. But it is hot and because we haven`t had a proper shower for a few days we thought why not. Cocktails at the pool were a mixture of juices and the drinks were Coke-Pepsi-Fanta etc. Anyway, we relaxed around the pool for the rest of the afternoon. It was also at the pool that we were told by UN staff that some serious shooting incidents took place yesterday and a helicopter was high jacked from the UN. 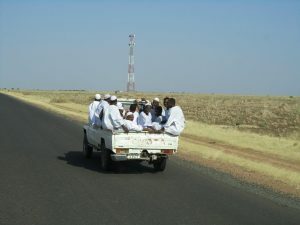 They were very surprised when they found out we were travelling through Sudan and basically, they thought we were mad. Time for shopping because we will be in the desert for the next 2 weeks. We also required water as we are running short again. At $45.00 for 35 litre we decided that water from the Nile River was good enough. We do have a strong filter so let`s hope all the bugs are gone. At 2.30pm we arrived at the Saudi Embassy and yes, our Visa was ready. Next, the ferry tickets to Jeddah. Easy but with no computer in sight it was all hand written. 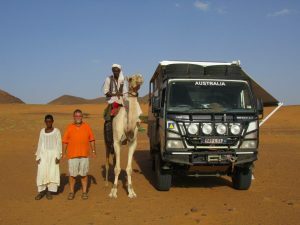 We paid 1000 Sudanese pounds for the truck, the two of us and a cabin. I asked the stupid question. “What if the Ferry is full? ” “Sir it is never full” was the reply. Sounds like the local bus that is never full either. Now for our Alien`s registration and we are cleared and ready to leave Khartoum. Funny no-one complained that we were 2 days late to register despite the 8 people it took to check and stamp our paperwork for the Alien`s Registration. All done, so another busy day but we also had fun days trying to negotiate the mad- house traffic in Sudan in a 40-year-old Toyota Taxi. It had more dents and parts missing than a dodgem car! I think our taxi driver has also been to left hand drive countries as he is able to drive on both sides of the road and even includes the footpath if it gets busy. 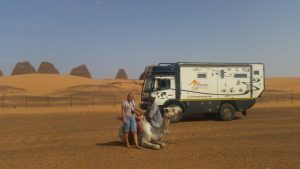 We filled up both tanks with diesel (50AUD or E26) and off we went for the 230km to Meroe Pyramids. We were told of a nice camp spot by a few locals. 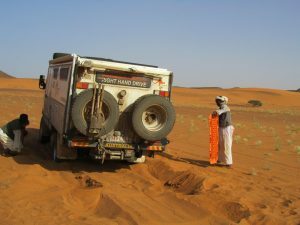 But at 48 degrees, with both diesel tanks full and the water tanks full, we got bogged in soft sand 600meters from our nice camp spot. It was there that we also realized we no longer had 4WD plus the limited slip diff is also out of action! Well if all technology fails we still have the MAX TRAX. What a superb product. 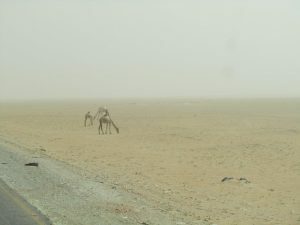 Two camels and two locals and one hour later, we made it to our camp and all was done. We had a spectacular sunset and a perfect view of the Pyramids. BBQ out and non-alcohol beer called Amsterdam and it is the end of another day in Africa. Tomorrow morning, we are travelling by camel to the Pyramids, so I hope the camel is strong enough! 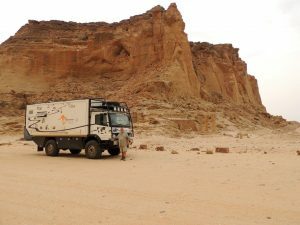 After the visit to the Pyramids of Meroe we continued the black top towards Atbara and then west towards Karima. We bush camped along the way. 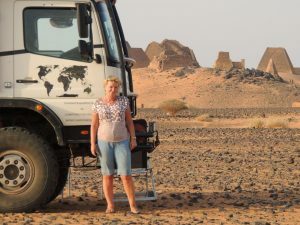 In Karima we visited Jebel Markel but then we got well and truly bogged. With no 4WD it is hard to get through soft sand with 7.5 tonne. It didn`t help that we had our fuel and water tanks filled up to capacity. From here we continued to Dongola to meet up with the Nile again. 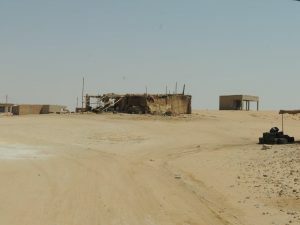 From there we turned north and returned to Karima where we visited the Pyramids of Nuri and tried to camp at the newly built dam, but we were refused due to security issues. 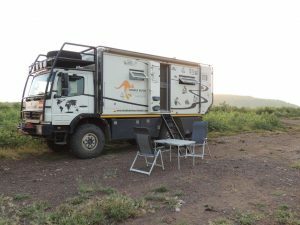 We decided to continue through the desert and found a nice bush camp just before dark. 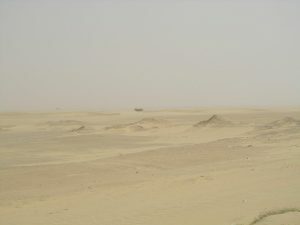 The next day it was back towards Atbara following the railway line and the beginning of a sandstorm which not only got us lost but also bogged again. We have been hit by the dreaded Sudan sandstorms. Being told to stay near the power lines was easier said than done! But again, with visibility around 10 meters, we did make some mistakes and yes, we got bogged. 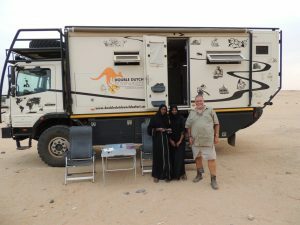 It is at this time you miss your mates in OZ (Bob and Margaret in particular) and it also tells you a lesson that you should not travel on your own in remote desert country. Tyre pressures down from 102psi road pressure, to 52psi, allowed us to plod through. Lucky for us even in the most remote parts, people live in either tents or clay huts and they all are very happy to help. And no money is accepted for any help. Places we visited: Meroe Pyramids, Karima (Jebel Markel and Nubi Ruins), Nile River Dam, Dongola and the desert trip back to Atbara. 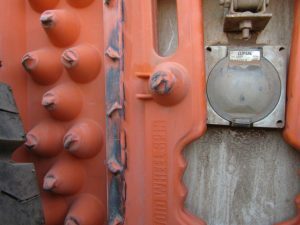 It was a sign of relief when we hit the bitumen again just before Atbara and from there we drove all the way to Port Sudan on the black stuff. Problem with the tar roads is that you get sick and tired of the road blocks. No one speaks English, no procedures and our details are written on the back of a match box; or A4 sheets with other scribble notes on the back, or sometimes they try to call someone to find out if it is okay for us to proceed. Or after 5 minutes of talking they decide it is too hard and let us pass anyway. Funny enough, neither the police nor the army personnel even have a pen or pencil. They are unable to read a passport etc. It does make you frustrated because we have no idea what they are trying to achieve. Once we were asked for our passports at a petrol station by a police officer in a 1965 old Toyota; As soon as it was all okay, we pushed the police car to get it started! I say good luck to the Sudanese Police and the Army. They need all the luck they can get. One of the reasons for the roadblocks is of course the problems in Sudan and we are currently travelling in the Eastern Part. 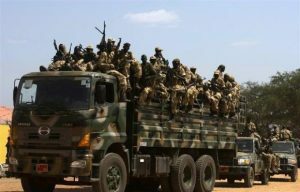 The Eastern Front is a coalition of rebel groups operating in Eastern Sudan along the border with Eritrea, particularly the states of Red Sea and Kassala. The Eastern Front had threatened to block the flow of crude oil, which travels from the oil fields of the south-central regions to outside markets through Port Sudan. A government plan to build a second oil refinery near Port Sudan was also threatened. 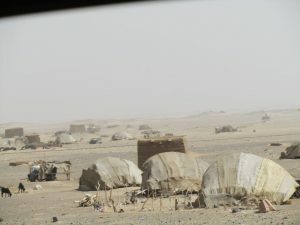 The government was reported to have three times as many soldiers in the east to suppress the rebellion and protect vital infrastructure as in the more widely reported Darfur region. We had become very concerned about our tickets not being correct (no computers and we have already paid). 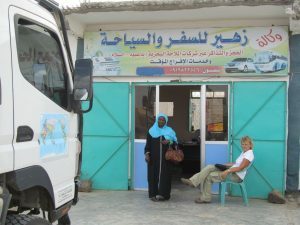 We decided to detour to Suakin (ferry leaves from there, not Port Sudan) and after 2 hours we found a small office that represented our Ferry. It was lucky we checked. 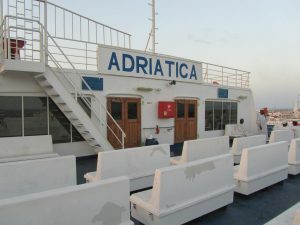 Our Saturday boat was cancelled, and the Thursday boat was full (pilgrimage to Mecca). So, it was either Tuesday night or wait another week. From here it was onto the Red Sea (beach) for a well-earned swim and some R & R. Sudan, without doubt, has the friendliest people in Africa but unfortunately the officials and road blocks are a nuisance, and everyone seems to be paranoid at the roadblocks. We left Sudan with mixed feelings. 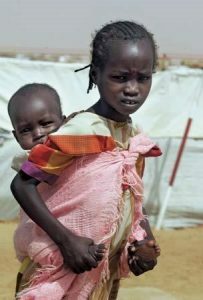 Most people see Sudan as a country of people suffering and seemingly endless strife. 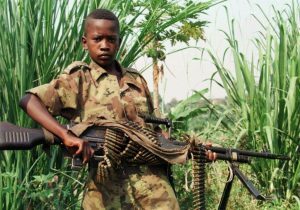 The brutality of nearly 50 years of civil wars and a succession of humanitarian crises have retarded economic development. It doesn`t matter who you speak to, all would like to put the violence behind them. But it appears with so many ethnic groups living together, peace seems nearly impossible. In this coming January, elections take place and most believe that renewed civil unrest will start as early as next month. The south would like to become independent, but the north will not allow this. For us, the people have been the nicest in Africa. Sudanese, being rich or poor, are among the most gracious people we have met. Let`s hope for their sake that they sort out their differences, so they can live in peace. We are leaving Africa behind us with many good memories. We have made some very good friends and we have met some very friendly people. Sadly, we have witnessed poverty and corruption and in some places the two go hand in hand for people to survive. Corruption at government level however is hard to accept, particularly when citizens are starving. We have learnt how to drive in chaotic cities and use the horn to keep things moving along. We have seen some of the best and some of the worst roads in the world. One thing is for sure, we will never complain about roads back home again. From what we can see and read, we believe the media gives a very different picture of Africa when compared to what we saw and experienced. The people, despite all their hardship, are Africa`s greatest asset. We can`t help wondering what happened to all the foreign aid that has been poured into this region since we were last here in the 1970s. Here we are in 2011 and nothing much has changed over all those years. There is still acute poverty among the people – good people who seem helpless. There are still massive health issues. There is no running water and so many millions of people are living in squalor. All this, despite the billions of dollars we have all poured into foreign aid over the years. Where does the money go? 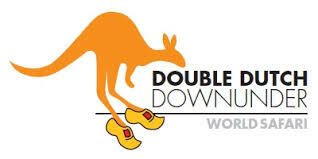 On a sour note from our point of view is that as a `thank you` for all the aid the rest of the world has provided, the governments of most countries in Africa seem to go out of their way to rip off tourists and foreigners and they seem to encourage private businesses to do the same. Ethiopia is the joke of the whole of Africa about government rules and regulations and the way they are administered. It is also so sad to see so many women and children reduced to begging right throughout Ethiopia. Throughout our travels in Africa, we have tried to point out a fair price when we see one. That has been to assist those who come after us. With every mention of a cheap meal or cheap drinks or cheap fuel, there is also a contrast with expensive government fees. If the government charges were more reasonable, tourists like us would gladly pay more to the grass roots people for their goods and services. And on a final note we say farewell to Ethiopia, the only country in Africa that made us feel so unwelcome. We can only concur with so many other blogs from other foreign visitors to Ethiopia who have stated. A magnificent country with huge potential. It is just a pity about the attitude of the people. We have enjoyed our travels throughout the rest of Africa. South Africa is one of the best destinations we have visited anywhere in the world. We will be back.